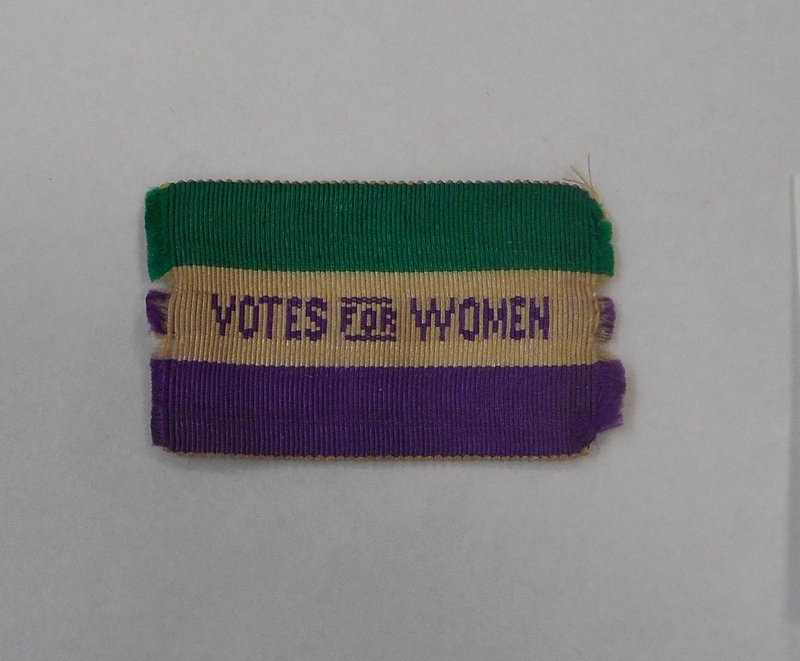 Cicely Lucas's ‘Votes for Women’ ribbon. 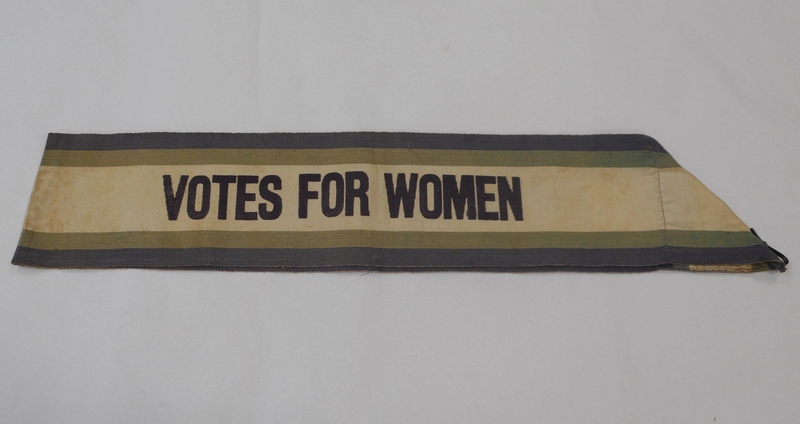 Cicely Lucas's ‘Votes for Women’ sash. I have been in charge of looking after the Social History and Costume collections at Warwickshire Museum since 2012, but have worked here for much longer, initially as Keeper of Archaeology. I have known about the four objects we have in our collections that relate to the suffragette movement for some time and have been fascinated by this period in history since a teenager. So, with 100th anniversary of women first gaining the vote (only those over 30 and holding property), I wanted to make sure that we told the story of the movement for women’s suffrage in Warwickshire. The objects on display at the Market Hall Museum were owned by Cicely Lucas, she was a teacher who lived in Claverdon and was active in the Women’s Social and Political Union. Her suffragette ‘Votes for Women’ sash and ribbon, along with her enamel WSPU badge tell their story of protests, demonstrations and (in some cases, but not Cicely’s) arrest. The small pebble however shows how quite mundane objects can have amazing stories attached to them. This was thrown at Cicely during a rally at Winson Green prison, narrowly missing her. The pebble obviously meant a lot to her, perhaps as a souvenir of a significant time in her history, as she kept it in her jewellery box for the rest of her life. The displays at Market Hall also include photos and documents from other important figures in the suffragette and suffragist movements. Mary Dormer Harris was a Suffragist, seeking political change through peaceful means; she became a regular correspondent with Christabel Pankhurst of the WSPU. In the letter at Market Hall, Christabel asks for Mary’s help in increasing subscriptions and funds for the Union, she also comments on political figures of the day including Winston Churchill. The display at the Market Hall Museum will continue until the end of 2018 – we have a double celebration this year as it is 90 years since all women over 21 got the vote. 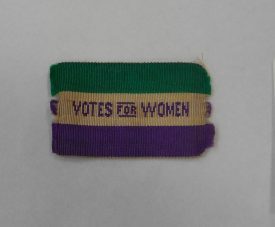 The museum shop is also putting out the purple, white and green with some great suffragette related gifts and stationery, including a pin badge replica of Cicely’s ‘Votes for Women’ ribbon.